Everyone has heard of Cheddar, if only because of the cheese. These days, the cheese is probably the least of the attractions as so-called cheddar cheese is manufactured all over the world. But real Cheddar is still one of the world’s best cheeses and has been made here since at least the 12th century. The village of Cheddar is an ancient settlement, on the edge of the Somerset Levels, which still has the remains of a Saxon Royal Palace, now within the grounds of the Kings of Wessex School. This has long been the centre of a thriving agricultural economy. There were originally several small manors along the Cheddar Yeo, each with its own mill. There were settlements here in Roman and Saxon days, and probably even earlier. Along with other towns and villages in this area, Cheddar was once involved in the large scale production of textiles. Cheddar has a mixture of old cottages and later properties. The market cross is very interesting and there is a 14th century parish church, among other historic buildings. It is a great centre from which to visit many other interesting places such as England’s smallest city, Wells, and Glastonbury, with its Arthurian and other associations. It is also handy for the seaside at Weston-Super-Mare, and only half an hour from the shops and night life of Bristol. The village has a large number of pubs and various accommodation for tourists. The River Yeo flows out from the beautiful Cheddar Gorge, which was named one of the four wonders of the world in the early 12th century. It is believed to have been cut by melting water in the summer periods during various Ice Ages in Europe over around two million years. The gorge is cut into carboniferous limestone, formed as long as 300 million years ago. This is Britain’s largest gorge, and the Cheddar Yeo in Gough’s Cave is Britain’s biggest underground river. The Gorge Cliffs are the highest inland limestone cliffs in Britain. The Gorge is a Site of Special Scientific Interest because of various rare forms of geology and plant and animal life. These include Horseshoe Bats, Peregrine Falcons, which nest on the cliff face, and Soay sheep, which graze on the scrub. The whole area is an Area of Outstanding Natural Beauty. There is a cliff top walk around the Gorge. Gough’s Cave is a famous archeological site because of finds including that in 1903 of Britian’s oldest complete skeleton, which is 9,000 years old, and is known as the Cheddar Man. 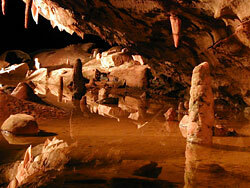 An ideal activity on a wet day is a visit to Cheddar Caves. The flow of water in the caves is spectacular after heavy rain. Cheddar cheese was originally made in the town and stored in the caves along the gorge. The cheese-making tradition is carried on by the Cheddar Gorge Cheese Company, who you can visit to see how the cheese is made. Naturally, it is possible to buy hand-made cheeses from the store here. When the Cheddar Valley Railway opened in about 1870, workers from towns had the opportunity to enjoy a day’s outing in this lovely place, resulting in the start of popular tourism. Since then, the area had welcomes hundreds of thousands of visitors from all over the world. Wookey Hole Cave is a short distance away and there is also a paper mill and an old time amusement arcade here. Other local attractions include the hill side steps of Jacob’s Ladder, from the top of which are fantastic views towards Exmoor and the coast, and Cox’s Cave. Cheddar Reservoir offers various water sports and fishing.